Boxing fans will be thrilled to know that we finally have a hack for Real Boxing 2 CREED by Vivid Games, featuring unlimited coins and gems! This is the official game of the upcoming Rocky spin-off, CREED, in which you train your character and complete different missions to become a champion. As you fight your opponent, you perform uppercuts, body shots, jabs, etc.. but should pay attention to the health and stamina (energy) gauges. 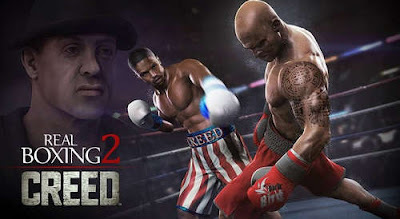 This one sure makes for a pretty intense boxing experience, and with Real Boxing 2 CREED Modded apk you'll be doing a lot of damage in the ring and out. Gems are required for different things within the game so now you have plenty, and a lot of money too! Have I mentioned that training has you playing out little mini-games to toughen up your fighter, and learn new combinations and moves! Also, the graphics are outstanding, the controls are intuitive, and everything else just works.. Read more about the game on Google Play Store. Install any Apk, Extract DATA and copy ‘com.vividgames.realboxing2’ folder to sdcard/Android/obb/ , then run the game!